When we think of green energy, the first image that comes to mind are these large, beautiful, majestic windmills, spun by wind, generating clean, renewable power. Recently there has been quite a bit of debate in my home state of Massachusetts regarding a wind farm project on Nantucket Sound. Until seeing this film, I didn’t realize that I knew so little about the advantages and disadvantages of wind turbines. ‘Windfall’ is an insightful, thought-provoking documentary from director Laura Israel that explains everything you want to know about wind turbines – while taking you through how a developer essentially turned Meredith, New York upside down when it sought to bring wind farms to the small community. 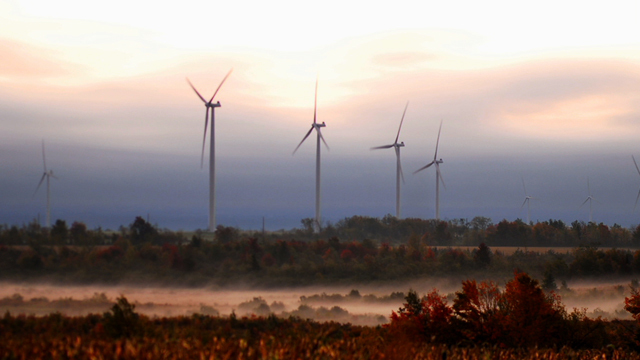 In a town hurt by the economic downturn, the idea of leasing their property for wind development is quite lucrative. While some in the town see this as their savior, many others see it as something that will completely disturb the peace in their otherwise tranquil neighborhood. The film educates you about the size of some of these windmills (400 feet or 40 stories), the size of their propellors (the size of a passenger jet), and the amount of noise pollution that they generate – which ranges from loud swooping (even louder in rain), to a low frequency that has shown to have effects on wildlife. ‘Windfall’ does an amazing job giving a platform to both sides of the debate. The film feels well centered, proposing that the audience really look at both sides, and make their own decision. Everything is broken down so perfectly, that the whole scope of the issue is easy to understand. I have to point out one technical detail that really impressed me. Rather than the usual digital pans and tracking that you see on archival photographs and titles in other films, the filmmakers created collages, which were tracked and panned through with the camera. This is a breath of fresh air. A lot of thought clearly went into the creation and design of these collages, and it almost felt like I was looking at a large cork board with all the information laid out. I think that this film is an important one, as the debate of wind power grows, it makes this film even more relevant. I hope that the filmmakers are able to find distribution so everyone has an opportunity to see this masterfully crafted film.